Since May 2016, over a hundred amateur radio operators around Portland, mostly Portland Neighborhood Emergency Team (NET) members, have checked into a monthly simplex net. The location and operating details of these stations were used to design new procedures for simplex radio communication by NETs. These new procedures are to help NET AROs establish simplex radio coordination with the Portland Bureau of Emergency Management (PBEM) Emergency Coordination Center (ECC) and with other NETs. Some of those procedures are described below. Our exercise continues to provide an opportunity for NET hams to become experienced with and knowledgable about this important mode of communication. Join us! Our exercise takes place at 8:00PM on the second day of the month. Net control is typically established on NET-TAC1, 147.58 MHz simplex. For information about how the net works and what to expect, send an email to Michael at AE7XP@ARRL.net, and he will put you on the monthly mailing list. There are currently about 80 active NETs distributed throughout Portland. In the event that all conventional communication means are destroyed, damaged, or congested due to limited capacity or higher priority use, amateur radio would become the primary means for coordination. All communication between the Portland Bureau of Emergency Management (PBEM) Emergency Coordination Center (ECC) and its NETs would be through the roughly 200 NET hams. The 40 of these that have to team designation Amateur Radio Operator (ARO) would be the primary assets for NETs in need of advanced radio skills. Simplex is direct radio-to-radio communication, without the benefit of a radio repeater. Current NET protocol states that the communication between given NET ARO and the PBEM ECC will be simplex. Amateur radio repeater control operators in the area, such as the Amateur Radio Relay Group (ARRG), have emphasized the need for this policy. They have made it clear that, in the event of a disaster, their available repeaters would be reserved for critical life safety communication. NET logistical coordination does not rise to this standard and would be subordinated to simplex. Not all NET ARO stations are capable of direct radio contact with the ECC, however. Consequently, the principal objective of a NET simplex radio procedure would be the relay any information by simplex to and from the ECC with minimum delay and greatest reliability. Other challenges to NET use of simplex have become evident. Simplex actually requires more operator sophitication than using a repeater for radio communication. There are many more ways that operators can interfere with each others’ transmissions. Radio operators inexperienced with simplex may become frustrated when other stations do not respond to their hails, transmitting unproductively and potentially creating unhelpful interference. Practice opportunities have been very few. Because of the limited range of typical NET ARO radios, it would be hard to tell in the midst of a crisis who is in charge and how best to get information to and from the PBEM ECC. To achieve our principal objective of a NET radio relay of information by simplex to the ECC with minimum delay and greatest reliability, a practice with three key features has emerged. 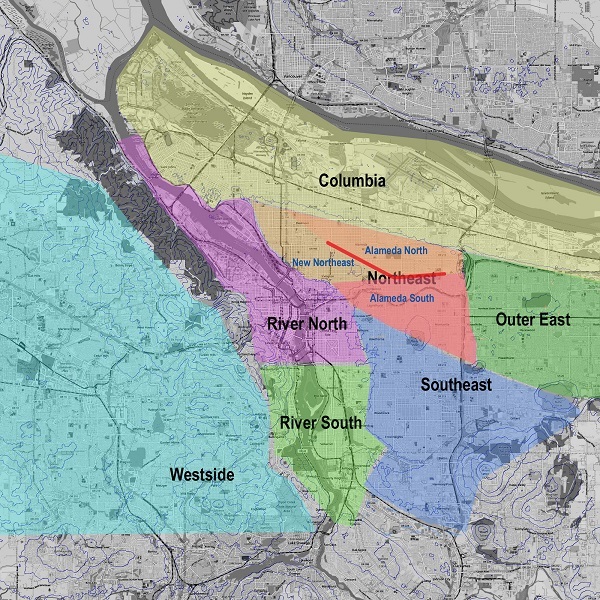 A map of Portland, segregated into nine regions within which line-of-sight communication is feasible. (See figure at right.) Separate radio frequencies would be assigned to radio sub-nets in each of these. Separate frequencies reduce interference and facilitate local resolution of problems. A station scoring mechanism that makes it easy for sub-net participants in each region to quickly identify among themselves a suitable sub-net control station for that region. Sub-net controls would be chosen to facilitate communication between NETs in their region and the ECC. A protocol for NET amateur radio operators across the City to quickly establish a net control, boot strap themselves into such sub-nets, and assign frequencies to those sub-nets. This overall net control would likely relinquish their responsibiltiy to the ECC when the City radio station W7ECC becomes available. This overall net control would remain on the NET tactical frequency, coordinate any necessary sub-net frequencies and directing new participants to the frequencies of sub-nets. At the same time and independently, sub-nets would select their respective sub-net contols, who would conduct the business of the sub-net. This brief summary is not intended to fully explain the experience, testing, and thought behind this preliminary procedure. For more information about the rationale and operational details about this practice, please download the document by clicking on this link.